The skin is our primary interface towards the world, serving both as one of our main communication channels as well as being one of the most important protective barriers towards our surroundings. Skin care products, topological drugs and medical treatments are all in need of enhanced testing procedures that, in an ethical agenda, can increase the transability from in vitro testing to in vivo usage of products. 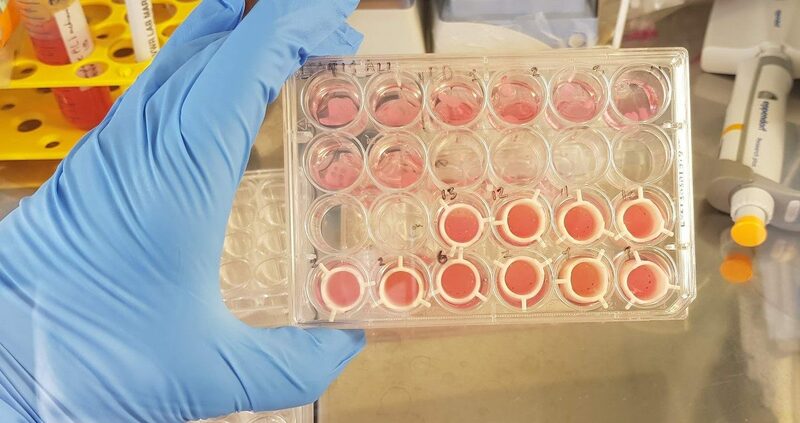 With tissue engineering and 3D bioprinting more representative in vitro models can be constructed, providing the possibility to limit the usage of animal models while increasing the physical relevance of the testing models. The aim of the following project was to develop a full thickness skin tissue model comprised of CELLINK bioinks using the technique of 3D bioprinting. The study involved three major parts; design model based on literature, 3D bioprinting of different models and evaluation of the models. The developed skin tissue model consists of three different layers: epidermis (top layer), papillary dermis (middle layer) and reticular dermis (bottom part). The epidermis is the outermost layer of the skin, predominately consisting of keratinocytes. The dermis is mainly comprised of fibroblasts and extracellular matrix, with collagen type I as the most prominent protein present. The papillary dermis differs from the reticular dermis in higher concentration of fibroblasts and finer collagen type 1 fibres. 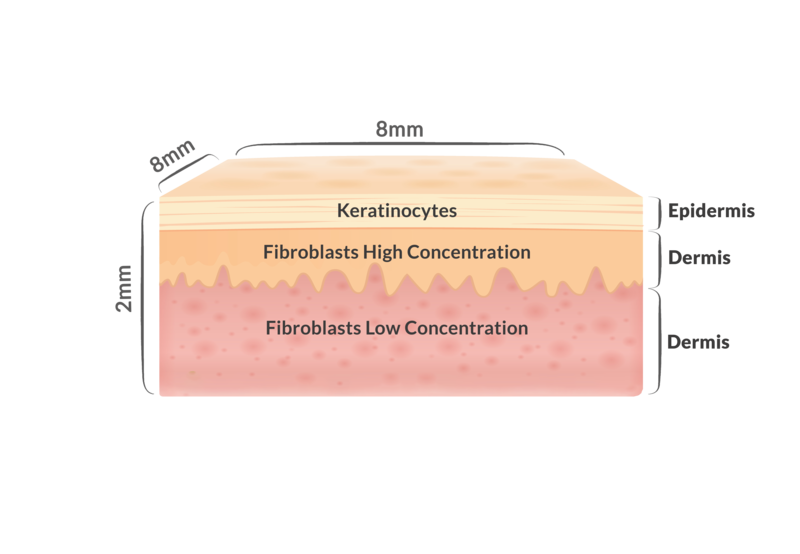 In our model, we used human epidermal keratinocytes (HEK) and two different concentrations of human dermal fibroblasts (HDF) to mimic the native distribution of cells. The bioinks CELLINK SKIN and CELLINK RGD, two different concentrations of compound X, either high or low, was added. CELLINK SKIN contains fibrinogen, a protein important for homeostasis, wound healing and promotion of angiogenesis. CELLINK RGD contains the RGD (Arg-Gly-Asp) peptide motif which interacts with receptors on the cell surface and facilitates cell adhesion. The table beside describe the conditions, if containing cells/ amount of compound X. To examine the co-culture effect of HEK and HDF, we evaluated the viability of 3D bioprinted co-culture constructs in comparison with the 3D bioprinted HDF monoculture as control. All cell constructs were bioprinted in CELLINK SKIN and cultured for 14 days. Live/dead imaging performed on Day 1, 7 and 14 after bioprinting demonstrated high viability (over 75 %) in both conditions. Interestingly, fibroblasts co-cultured with keratinocytes exhibited higher cell number and adopted native-like morphology after 14 days. 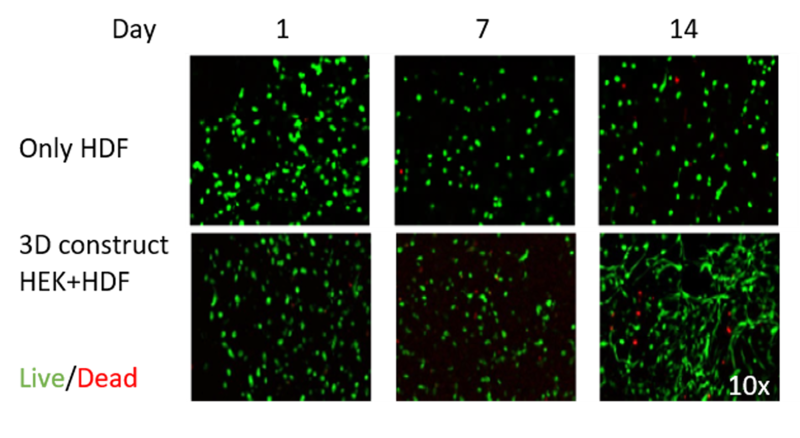 To evaluate the production of collagen type I in the tissue model, we performed immunofluorescence staining with collagen type I-specific antibody. The proliferation of keratinocytes was evaluated by immunostaining against keratin 10 (K10), a proliferation marker of keratinocytes. Green = collagen type I, Red = keratin 10, Blue = DAPI stained cell nuclei. Images were captured at 10x magnification. 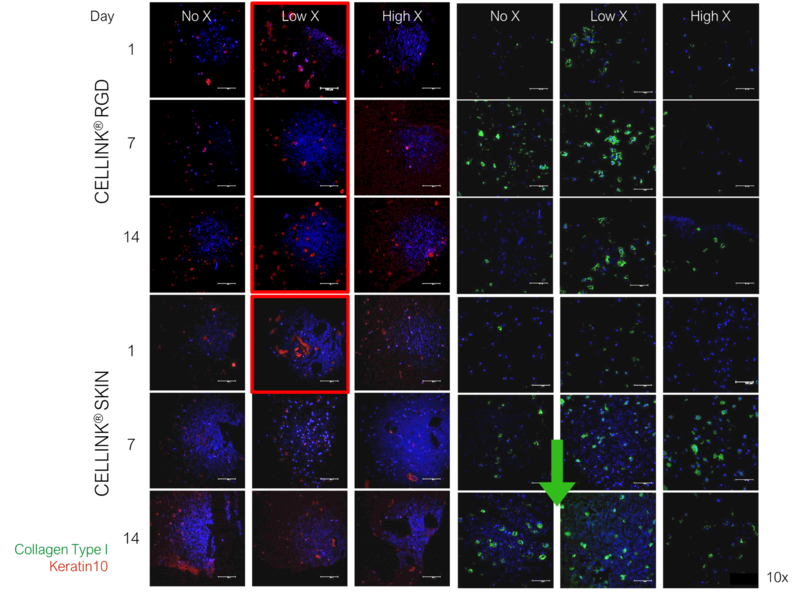 Immunostaining revealed high abundance of collagen type I in cells printed in CELLINK SKIN and treated with low concentration of compound X, with an increasing expression over 14 days. The expression of collagen type I in cells printed in CELLINK RGD and treated with low concentration of compound X decreases after Day 7. The expression of keratin 10 is reported to be highest in the conditions of low concentration of compound X for both CELLINK SKIN and CELLINK RGD with maintained expression over the 14 days in CELLINK RGD. High concentration of compound X results in a lower expression of both collagen type I and keratin 10 in both bioinks. In this study we demonstrated the construction of a highly viable, full thickness skin tissue model by using CELLINK bioinks. Both CELLINK SKIN and CELLINK RGD provide a suitable 3D environment for a functional skin tissue model. High and stable expression of collagen type I in cells printed in CELLINK SKIN implies a beneficial effect of the fibrin component of the bioink. High abundance of keratinocytes in CELLINK RGD maintained over 14 days suggest the important role of RGD motif in promoting the cell proliferation. Low proliferation of keratinocytes and decrease in expression of collagen type I after treatment with high concentration of compound X suggest a dose-dependent stress response or cytotoxicity.